May = summits. This month I am a guest on not one, but two amazing summits. What are the chances? I am honored and grateful to be invited to speak and meet listeners and viewers from all over the world! Starting tomorrow, May 16, the lovely Ray Ann Chi is replaying her momma summit for three days! Click here to catch up on my talk and many other lovely speakers helping moms feel great through nourishing food, inspiring movement and building a healthy lifestyle. I’ll be talking about my work and how our bodies carry memories, and need us to hold them in care and compassion through all we do! Listen here! We all love to move. It’s innate, intrinsic to life. Just watch kids play! How many of us, as adults, move with as much joy, curiosity, and as engaged with life as we did as kids? Modern movement science is reshaping our understanding of the primacy of movement for a happy and healthy human existence. It’s changing the way we think about fitness, exercise and overall wellness. Our modern world, with all it’s conveniences, is significantly lacking in movement. Plus, the patterns so many of us are practicing ~sitting, driving, on our phones or computers~ are having their effects. 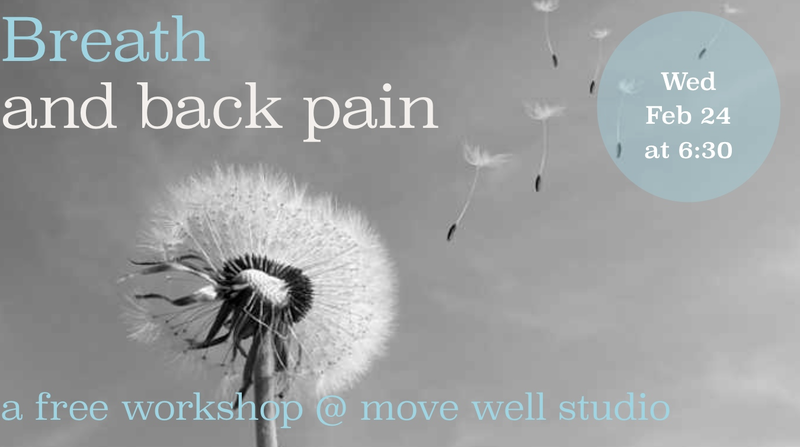 Neck pain, back pain, foot pain, joint pain & more are all too common. Repetitive strain injuries are popping up everywhere: from too much time on keyboards, to biking, running, and even from too much yoga! These –and even other physiological issues underneath– can be helped by looking at movement nutrition, the overall combination of all our daily movement. Think of it like a diet- we want a variety of the good stuff! I’m pleased to be part of this growing conversation in my own work, and as a speaker in an upcoming online even called Movement as Medicine. I’d love for you to join me in this unique gathering! Movement as Medicine is scheduled for release May 21-31, 2018, but go ahead and sign up now! Categories: interviews, news | Permalink. As many of you know, we podcast regularly on our coaching website over at EatMoveLive52. In a recent interview with Dr Kevin Pecca, the roles were reversed – I was in the interviewee seat. Much to my joy, Dr Kevin was a great host, curious, open and inquisitive about subjects I hadn’t thought about in years. You can listen to the interview here or grab it on iTunes! Here is the start of the interview, I hope you enjoy it as much as we did! Hi. It’s so good to be your guest. I’m so excited. You have such an interesting life story and just a true healer in every sense of the word. I am just very excited for this podcast. Thank you. Me as well. I’ve been looking forward to it. Galina, where are you from? I’m originally from Bulgaria, which is in Eastern Europe. No one knows where that is. If you imagine Greece, because everybody knows where Greece is, Bulgaria is right on top of it. It’s like a hat on top of Greece. It must be absolutely beautiful over there then. It is fabulous. It is a very small country, but we have such a variety of nature, really tall Alpine mountains, like Switzerland does. We also have the Black Sea Coast, which is just beautiful and warm, unlike the Pacific Ocean. You can go in and actually be very comfortable without a wet suit. It’s just such a great variety of being close to nature, people in Eastern Europe live very close to nature. It’s just been such a great place to grow and develop. It’s also been a very challenging place. I grew up in communism. For people of my generation and younger in the States, that’s a very vague thing. For me, it’s reality. That’s how we grew up. What was that like, growing up in a communist society? When you’re a kid, you’re a kid and life is normal. You have your mom, your dad and your extended family, and everything’s cool. You look forward to your birthdays. I was ten when communism went away. I have become increasingly aware of the fear that was in society at all times and the very difficult trying to make yourself small and keep yourself small to fit a model of society that was very much artificial and not very humanistic. Also, being very careful not to ruffle any feathers and not to shine in any way, like the opposite of what Western kids are taught. Categories: audio, interviews, Uncategorized | Permalink. Tomorrow, Wednesday, February 24 is the first of a series of three free classes encompassing the most common themes that show up at my office. Many people come in after injuries or with a chronic condition only to discover that there is a whole-body factor involved. Breathe better and suddenly your torso is more stable and your traps relax for the first time in a decade; start being more aware of how you hold your posture – your pelvis and your knees – and oh wow, your feet hurt much less often now. I wanted to share the information I teach in a free class format, so anyone interested can hop in and see for themselves if my work has a new key to health and function, a factor they were missing before, or plain simple: “no one told me”. Whether you are dealing with a health challenge of your own or helping a loved one on the path of becoming whole and well again, these three topics are for you. 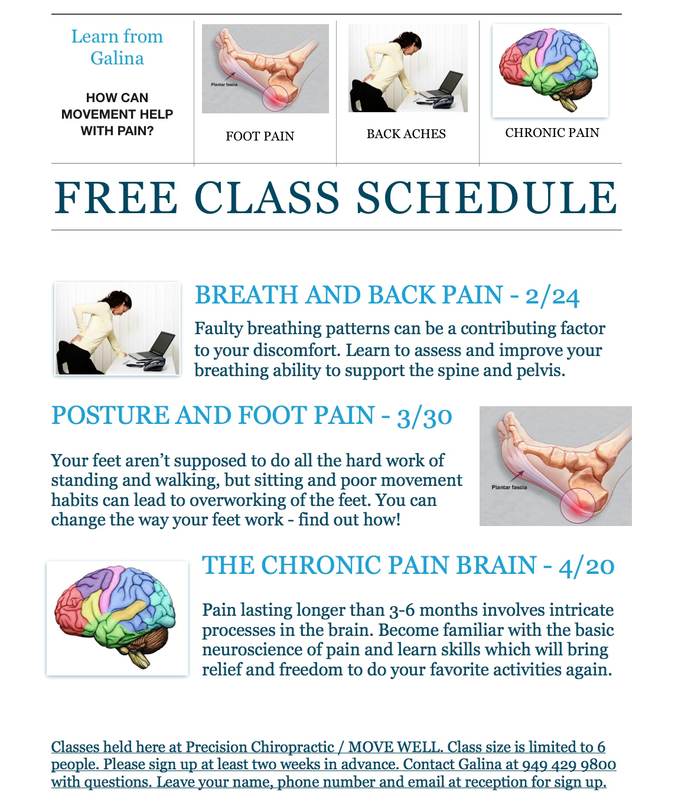 There is still some space for the event tomorrow, and only one spot left for the Foot Pain class. All classes start at 6:30 p.m. on Wednesdays.